The Tornado is a class A, single-ended overdrive using JFETs throughout. The close similarity between the electronic characteristics of JFETs and valves allows the Tornado to be effectively a pre-amp in the classic guitar amp format, but implemented in miniature and running from only 9 volts instead of the 2 or 3 hundred volts required in a valve guitar amp. The result is an overdriven sound that is much closer to that of an amp rather than a typical pedal but with pedal convenience. The control layout of volume, gain and tone looks familiar enough but the addition of the shift button widens the tonal palette. The shift button alters the response of the tone control, shifting the mid-range content and altering the turnover frequency so that both vintage and modern sounds can be produced. The gain control is also more sophisticated than it first appears. At the bottom end of its range the sound is clean and with a full bass response, but but has enough signal level to act as a clean boost. As the gain is increased the bass is gradually cut (pre distortion) to maintain a tight and responsive bottom end as distortion increases. At full gain the distortion is thick and saturated and sounds weighty in the bass without ever being bloated. The asymmetrical way in which JFETs overload - just like valves operated in class A - produces a natural spongy compression, and a source follower is used before the tonestack (just like many rock oriented amps use a cathode follower before their tonestack) to produce a biting edge to the sound. 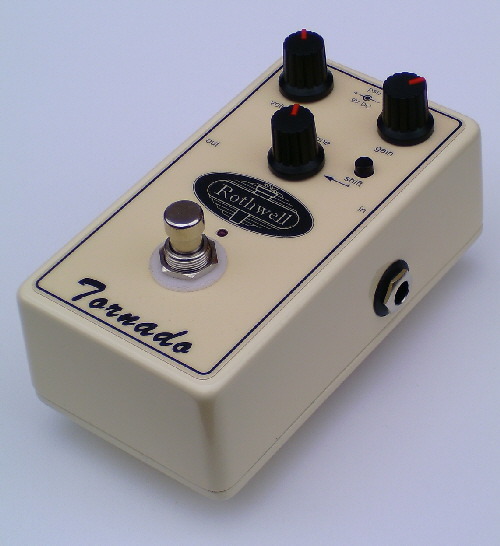 Overall, the Tornado produces a range of classic and modern rock sounds with aplomb and has an engaging natural compression to it (rather than the sterile, flat compression of many pedals). Current drain of the pedal is very modest - only 2.6mA when bypassed - so long battery life can be expected, but a high quality chassis mounted 2.1mm centre negative DC power socket is provided to allow the Tornado to be powered from an external 9 volt power supply. The Tornado costs £139 and can be purchased through our UK and international dealers (full list) or through the online shop.